East Brunswick Public Library | Can't Find It in the Library Catalog? Use JerseyCat Interlibrary Loan Form. Request that the library purchase a book, audiobook or DVD not held by the consortium at No Cost. Borrowing books from other libraries is called an Interlibrary Loan, or ILL for short! You can now do this yourself, from your own home, with JerseyCat. This service is limited to East Brunswick Public Library cardholders only. Beginning March 1, 2010 The Library will begin charging a $1.00 fee for all completed interlibrary loan transactions, even if the item is cancelled or not picked up. The fee will be collected as items are picked up at the Circulation Desk. The Library Board approved this small charge for a valuable, but labor intensive, service due to the recent loss of revenue from our municipal appropriations. Borrowers are responsible for the full replacement cost of lost or damaged books. Exact replacement price is set by the lending library in the range of $25.00 + and often includes an additional handling fee. The default pricing in the computer system and on a billing notice may not be reflective of the actual replacement price. Users DO NOT have to login in to use the system. You can click on the little arrow in the middle of the screen to remove the login in frame. Search qualifiers can be added in Frame 2, but this is not usually necessary. Resources can be changed in Frame 3 but should not be changed except when searching the New Jersey Union List of Serials (at the end of the list). The browser's Back button does not work. You must navigate using the program commands such as “Back to Results” or “Modify Search.” Each search opens up a new tab. Users may need to increase their screen resolution to use this version of JerseyCat. Otherwise, you will not be able to see and use all of the frames. To increase your resolution, right click on your computer's desktop. Select Properties, then select Settings, select a higher resolution until you can see the entire page. If you have increased your screen resolution and the text on the page is too small to read, clicking on the center or right A in the 3As in the top right corner of the screen will increase your text size. Please note: Before requesting any item through JerseyCat, please check the library catalog to see if the library owns the item you want. The Library will charge $1.00 for each interlibrary loan request for items borrowed from other libraries. This charge will be applied to the customer’s library account upon delivery of the item even if the item is not picked up by the customer. You may request a maximum of 5 items that this library does not own. You will need to be patient until the entry page loads. You will see a message: "Please wait while the Iluminar loads." This search interface uses a tabbed display that allows you to submit and navigate between Multiple searches. Each time you submit a search a new tab is added for that search. Click on Advanced Search on top right side of the toolbar. The Advanced Search Screen lets you create complex searches. Enter your search terms in the top box. BEGINS with the words you entered into the top box. Note the Add text on the right-edge of the screen. AND - finds items that contain the 1st search term AND a second search term. OR - Finds items that contain the 1st search term OR the second search term. NOT - Finds items that contain the 1st search term but NOT the second search term. You may use up to three search terms in the first frame. This tab allows you to add filters to your search. If you use too many filters, it could severely limit the number of results you get, so don't overdo it with filters. Libraries - Lets you limit your search to selected groups of libraries. Format - Lets you limit your search to items in a specified media format (Books, Computer files, etc.). This tab allows you to select specific libraries to search using the checkmark next to the library name. Unless you know of a specific library where the book is located and know that it is checked in there, the library recommends that you don't use this section. Click on the Search button on the right side of the screen. Results are displayed in the next frame that opens up. Results are titles with one location. 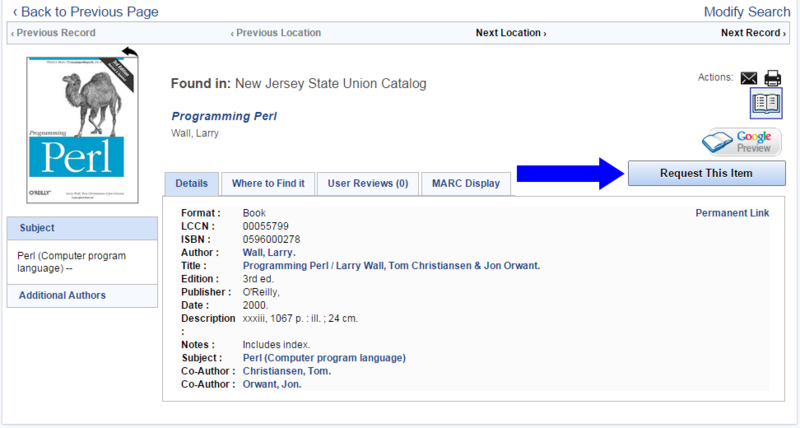 Other locations can be seen by clicking on the Libraries button. Click on the title you want. The information about the item is displayed. Click on the Request This Item button on the left side of the screen. The request form opens up. Fill in the request form. You have to scroll down through the form to fill in all the information. The Fields in red MUST be filled in. 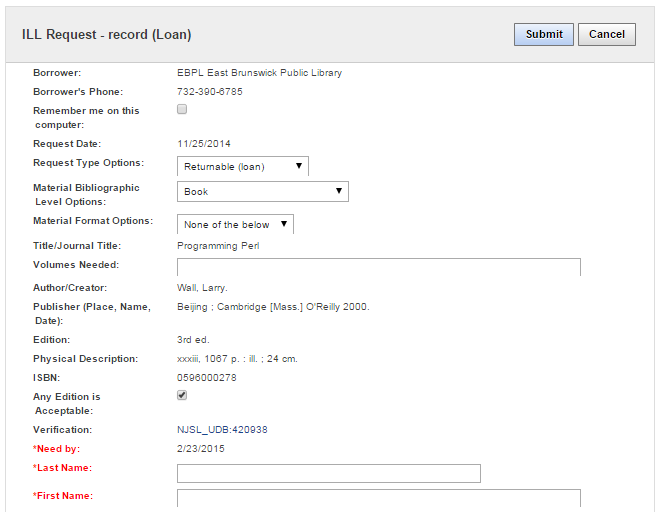 "Your Library Loan request (ex. 123456) has been submitted. You may track the status of your request in the Items from Other Libraries in My Account, if available." You will receive notification when your item has arrived. All borrowed items are picked up at the Circulation Desk at the library. If you need additional assistance please call the Information Desk for assistance at 732-390-6767. If you are looking for materials that are not listed in the Library Catalog, you may also use our online Request for Books, Request for DVDs, Request for Audiobooks or the Request for Music CDs forms to request that the library purchase them. The library will either purchase the materials or borrow them from another library for you (see ILL or Interlibrary Loan description above) depending upon date of publication, availability, and the price of the item(s). This service is limited to East Brunswick Public Library cardholders. The Library is no longer accepting requests for software packages or PC games due to vendor licensing restrictions.